I am going to start a series of blog posts called Liska Loves. It will include products, places and things that Aaron and I have loved. I will feature things I have recently seen in the shops, and link to previous reviews if we are still enjoying the product. This week I am really enjoying cleaning products. Anyone who knows me, knows I hate housework/cleaning. That's why I ONLY like products that make my life easier. These next two cleaning products (Dettol and Vanish) are things I have bought, not that I am reviewing, but I want to mention them as they are truly making my life easier. I love the new Dettol Oxygen Power and Pure products - I have the kitchen AND the bathroom sprays as pictured below. As they are *new* out they are on promotion pretty much everywhere, so if you hate paying the earth for cleaning products (as I do) grab these while they are cheap. I normally have to make a special shopping trip to Savers for cheap cleaning products but the great thing with these is they are on offer pretty much everywhere at the moment (don't buy in a supermarket that's not promoting them). I got the bathroom one I think in Lidl, and loved it, so got the kitchen one in Co-op. BARGAIN: Tesco is doing them for 1.50 GBP instead of 3.00 GBP until 04/03/2014. It gives a powerful clean without leaving any harsh chemical residue behind, as its Active Oxygen ingredient breaks down to just water and oxygen, so there’s no need to rinse afterwards. As well as being tough on dirt it kills 99.9% of bacteria. Power and Pure is available for kitchen and bathroom in spray and wipes. I bought it in Tesco for 7 pounds on Valentine's Day, but only got round to using it yesterday. We live in a 1st floor flat and the hubby was complaining recently that a couple of the lower steps were a bit brownish (mainly due to the wet weather we have had of late). He was talking about all sorts of extreme things like getting new carpet. I simply got out my (not Vanish) carpet stain remover and cleaned the whole staircase. HOWEVER, the stairs are closed top and bottom. No ventilation. No heating. They didn't get to dry properly and a couple of days later the whole staircase had a whiff! A major whiff. What did not help is the scourer that I spot cleaned the stairs with may have been "used" -eeek! I am NOT a domestic goddess. My solution to the whiff: I got in a time machine back to the 1980s, bought some Shake 'n' Vac, to put the freshness back and was rather smug. HOWEVER (again) the smell returned within a couple of days. WHAT HAS WORKED HOWEVER (3rd time lucky) is Vanish Carpet. - You simply vacuum (the stairs are normally hard work, but no longer thanks to the next product below). - You then brush the Vanish into the carpet straight away with a soft brush so it goes into the pile! - You then SHAKE the Vanish evenly over the carpet. Leave it for a minimum of 20 minutes. It's in a bag with holes in the bottom and a handle on the top - it's easily done! - After the 20 mins, you vacuum the Vanish off. Thank God the Dyson DC59 is not only cordless, but also has superb suction power so this was easy. This pic shows the Dyson DC59 with the short attachment which makes cleaning the stairs/car or furniture very easy! My Dyson DC59 (this was an item I was provided with for the purposes of a review, but I have NEVER EVER loved anything SO much!) In fact it has been life-changing. I never used to vacuum often at all, and if you know about energy, energy stagnates unless you clear it, ESPECIALLY on the floor. Now I often vacuum 3 times a day, as the DC59 is cordless it is SO easy to whip it out and spot clean wherever and whenever you want. The long hose neck is easily changed for a short attachment (like in the photo above), which means cleaning the stairs is as easy as if you are using a car vacuum, except you have the suction of a proper one. My stairs look and smell fab now (thanks to a combination of the Vanish and my Dyson as above). 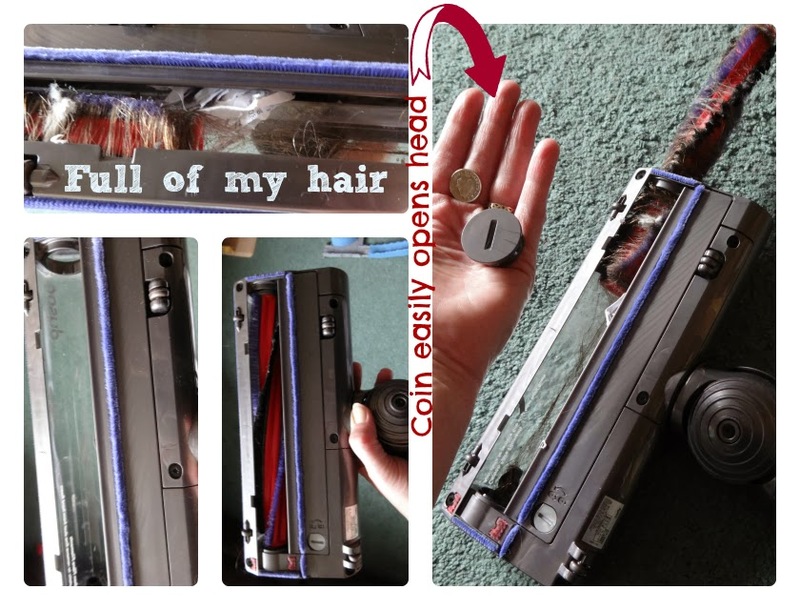 With my previous upright cleaners (recent one being a Vax and my long-term one being the original DC01) hair always used to get stuck on the mouth. Getting it off was always problematic. Luckily I went to a Dyson event and their scientists had told me what to do. At the edge of the suction head is a groove that you simply put a coin in and twist. The whole thing comes apart and getting the hair off is a piece of cake. I hadn't noticed a drop in suction power when it was clogged but it did seem to work even better once clear. I am so so glad I opened it up. It gave me chance to clean the inside of the clear tube, AND it meant I could get the PAPER out. We recently bought a new shredder and Aaron thought it would be fun to empty it on the sitting room floor - obviously I picked up what I could but the last bits were vacuumed, so I took the chance to get those bits of trapped paper out in addition to my hair. Thanks to Chinese Herbs (another thing that #LiskaLoves) my hair is NO LONGER falling out at the rate it once was. Vacuuming regularly really gives me and my home a lift, and leads to further decluttering due to the "light" energy it brings in. I can't recommend the DC59 enough. I know some people say that it doesn't do a large enough area before needing re-charging but I have not found this to be the case. Yesterday for example, after I had left the Vanish Carpet Power Powder on for long enough, I set about vacuuming it off. I have a tall flight of stairs and spent quite some time on each step. It was ONLY when I got to the top and final step that the charge ran out and I smiled as it was quite good timing. The trick is to then plug it in straight away, so that it is ready for after-meal time crumbs or the next time you want to use it. Finally, I said I would feature things we have reviewed in the past that we still love. 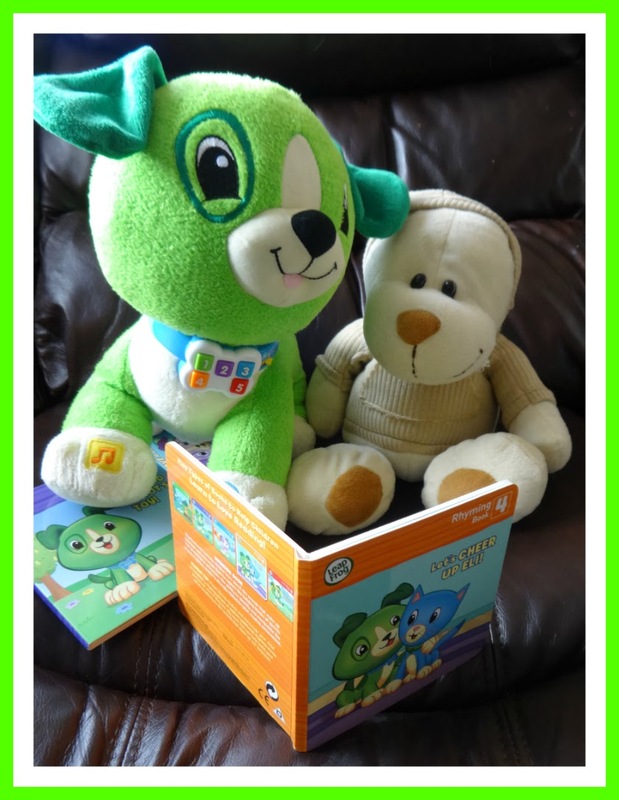 We still love our Read with Me Scout from LeapFrog - it's always on our sofa, ready for Aaron to grab whenever he wants to play with it. This was our review of it. 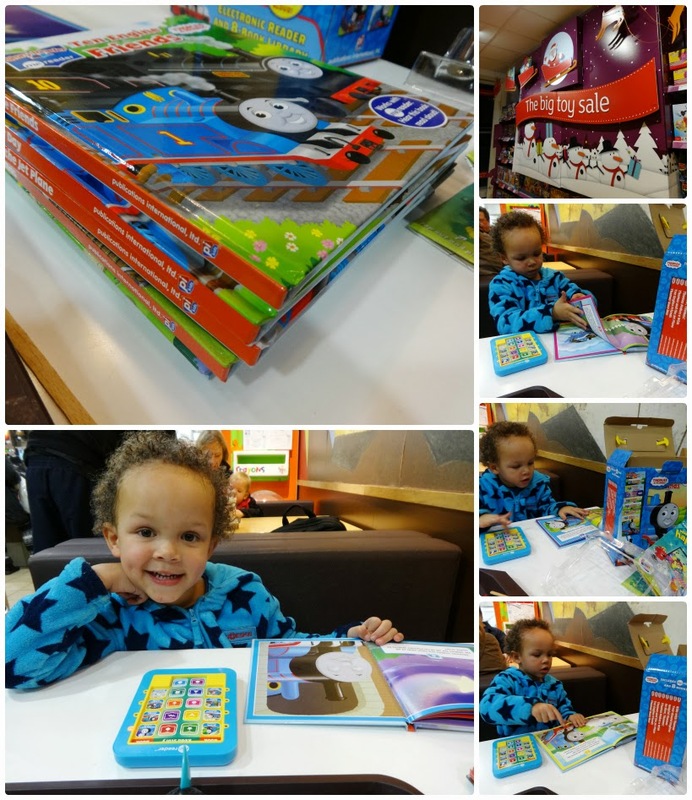 A similar product that Aaron loves just as much is his Thomas Me-Reader which he plays with just as regularly. I got it for 15 pounds in Argos but they are now charging 19.99. It is such good value as it is an electronic reader but also contains 8 hard-back books, which actually are worth that in themselves. It's a "toy" Aaron never gets bored of (we've had it since before Xmas) and GREAT value. I have paid more for things he has played with less - haven't we all! I don't need to encourage Aaron to read. He LOVES reading, letters and numbers and is now starting to write letters, as it's now been a few weeks since he can recognise all of them (he stops to read the letters on road signs when we are out and about). He's 3 years and 8 months. He'll literally say "R O A D spells Road"! You press the corresponding button that matches your chosen book, and then there is a symbol that matches each page. It is so so intuitive that Aaron quite happily plays with it by himself, often reading all 8 books in one sitting. He worked out how to use it on the day we got it (sitting in McDonalds' as above) with no explanation from me. Great for the Thomas fan who is an early reader/pre-schooler! I love certain cleaning products too. I really want to buy some wipes I think, instead of using kitchen towel or a sponge. They just make life easier!